I started painting in February this year after an accident left me mobility challenged. This is the first painting I have ever completed. I will keep it to remind me of how far I have come. As well as anything else in the painting the river is done really well. Just about throw a stone in it and hear it splash. I can't believe this is your first painting. I can't wait to see future paintings. Love the reflections! Well done Jackie. If this is based on speed painting, imagine what you could do if you took your time. Keep going girl. 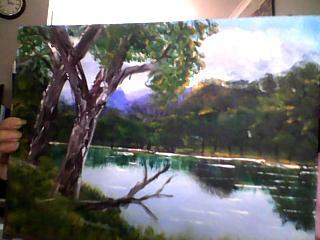 I'm really impressed with this as your first painting ... you are starting at a much higher base than I did! I wish I could see an enlarged version of the photo as it's a little hard to see some of the detail - for instance I can't really see the greens you refer to but I suspect they may be a little bright. The river water and reflections are totally believable and create a lovely sense of calm. There is also sense of distance into the hills at the rear of the pictures. Hope you get lots of joy from your new hobby! Hi Jackie - I really wish I could see an enlarged photo! The picture looks really impressive and has a lovely calm quality about it. The water / reflections are totally believable as is the sense of distance too. I can't really see the greens you refer to but I'm guessing they may be a bit bright? Congratulations and I hope you get lots of joy from your new found hobby.